Independent studies have confirmed statistically significant achievement gains. In Minneapolis, between a third and a half of the previously non-passing students passed the Minneapolis District’s benchmark test and advanced to the next grade level. 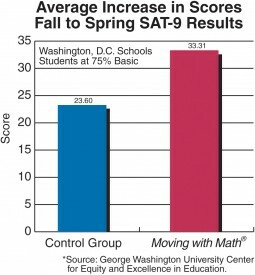 In the District of Columbia, a study completed by George Washington University Center for Equity and Excellence in Education (GWU/CEEE) compared results of Pre-Tests used in Moving with Math® and Stanford 9 Tests in the fall to Moving with Math® Post-Tests and Stanford 9 Tests in the spring. The GWU/CEEE findings show participants had statistically significant achievement gains using both the Moving with Math® tests and the Stanford 9 tests; and also when comparing participants to a control group with similar abilities not enrolled in the program. Basic and Below Basic students showed the greatest gains. The increase in scores for students enrolled in Moving with Math® was 40 percent greater than the increase in scores for the control group. Comparison of Pre-Test to Post-Test results show passing rates doubling and even tripling.